Making Turkish delight – also known as locum – is complicated and labour-intensive, and many traditional recipes are closely guarded secrets of Turkish confectioners, whose families have followed them for centuries. This simplified recipe may not be as good as that served to the ladies of a Sultan’s harem, but it is much lovelier than commercial Turkish delight. Do try it! Makes 24 pieces. 1. Heat the water, orange and lemon juices in a heavy, non-stick saucepan. 2. Add the agar agar or vegetarian jelly crystals, and stir on a gentle heat until they have dissolved. 3. Add the sugar and food colouring, if using, and increase the heat. Bring the mixture to a boil, then simmer on low heat for 20 minutes, stirring occasionally. Add the nuts, if using. 4. Remove from the heat and cool the mixture, stirring from time to time until it comes to room temperature. 5. Pour the mixture into a square or rectangular dish, and place the dish in a basin of ice-cold water. 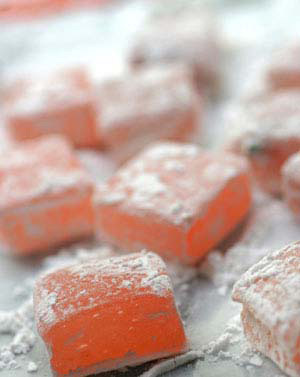 Cover the dish with a cloth, and leave it in the fridge until the Turkish delight has set. 6. Remove from the fridge and bring it back to room temperature. Cut into 24 squares using a greased knife, and dust with icing sugar. Store in an airtight container, or wrap in cellophane, tie with a colourful ribbon, and give to someone you love as a gift.